Read our Green Light Slot review and see screenshots of Green Light which is an RTG slot game with a free spin feature and a random progressive jackpot. Find out which RTG casinos offer Green Light slot. Get the 3 Green Lights and win big! 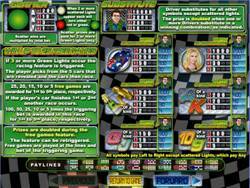 5 Reel, 20 Payline real-series video slot based on an exhilarating Car Racing theme. Featuring a Random Progressive Jackpot and a Racing Bonus Feature. Race Car, Trophy Girl, Car Trophy, Champagne Ace, King, Queen, Jack, Nine, Ten. The Wild will substitute for all symbols other than the Scatter symbol. The Wild multiplier symbols will double the payout of any winning combination it helps to complete. Get a minimum of 2 or more Green Light symbols anywhere on the 5 reels for a winning combination. The Random Progressive Jackpot may be won at the end of any regular game and will trigger randomly. A minimum of 3 Green Lights Scatters appearing on the 5 reels will activate the feature..
At the start of the game you get to choose a racing car, free spins will be won depending where your chosen car finishes at the end of the race. If the chosen Race Car comes in 1st or 2nd place then another Race will be activated. An action packed game for the race of a lifetime with shiny racing cars, powerful engines and burning tyres! Be the first to cross the finish line and win!